April solicitations, First Looks -- and more! James Woods, veteran actor and star of CBS' Shark, returns to Family Guy for the Sunday, Feb. 17 episode on Fox. Woods will again guest-star as himself in the "Back to the Woods" episode. 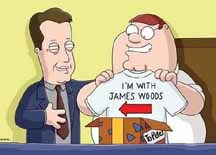 "James Woods returns after being locked in a crate to seek revenge against Peter. First, James steals Peter¹s identity and moves in as head of the Griffin household. Then, Peter goes out and ruins James career and image." The story picks up from the "Peter's Got Woods" episode that debuted on Sept. 25, 2005. The image above is from that episode. Look for more Family Guy news soon. Desperado Publishing has released its solicitations for April. Big City Comics has released its solicitations for April. * Above is a first look at covers -- with trade dress -- at upcoming Marvel Comics titles. Click on the thumbnails for larger images. Amored and ready for combat! Based on the big summer movie Iron Man, this silver prototype armored hero brings Tony Stark to life in a whole new way! 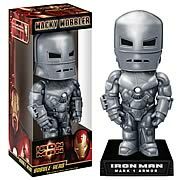 Complete with a real bobbing head, this 6-inch scale plastic bobble head features a personalized display base and is ready to save the day.